Examination answer scripts and later when we would pack our bags for a vacation after he had submitted the mark sheets. Baba was the senior Mathematics teacher in Don Bosco School in Calcutta as well as the co-chief examiner of the ICSE Boards. So, during the first half of the holidays the whole house would be stuffed with cardboard boxes of scripts that would eventually decide the fate of youngsters who scribbled their knowledge of numbers on them. Or so, as we were made to believe in those gullible years by every teacher in that non-digitised world of ours! 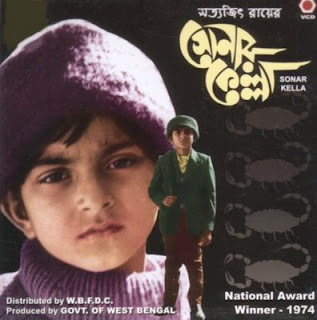 Satyajit Ray's Feluda flick, Sonar Kella takes me back to one humid morning during summer recess when my father announced, "Let's just quickly finish today's quota and in the afternoon we will watch Sonar Kella!" My eyes lit up. I quickly made him a cup of tea (I was 15 then) and got him his specs. He sat down, brandished his red pen over the scripts, and started deciding the 'fates' of the helpless children. Intermittently, he asked me to cross check the calculations so that there were no errors later in the tally sheet. Sharp at 12 noon, he wrapped up, we both finished our ablutions, gobbled our lunch and sat down to watch the film. For the 16th time. Ignoring my mother's high-pitched, "God! How many times more..."
Last night I watched this National Award winner again. Tucked inside a blanket, Malhar sleeping by my side, I embarked on the adventurous journey with Feluda, Topshe and Lalmohun Babu to catch the devious kidnappers who take Mukul away. The arid beauty of Rajasthan, especially Jaisalmer, and a mug of hot chocolate kept me warm. Interestingly, the film had triggered me to visit the place and my husband made it happen a few years after we got married. As we walked through the serpentine lanes of the old fort, which is still inhabited, we kept wondering how the movie was shot here and the various experiences the artists must have had. 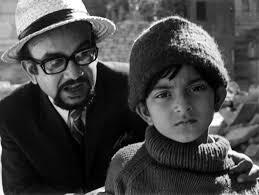 Sonar Kella (1974) is not just a film for me. It is a harbinger of memories, memories of my father and how we bonded over the film, and of us, two lovebirds who travelled to places discovering the world and each other. you are game for thrills. 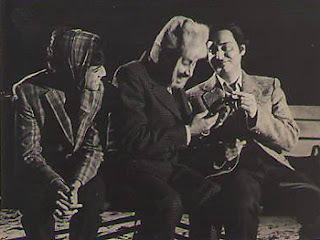 Based on the story (published in 1971) of the same name by the director himself, it has Soumitra Chatterjee playing the sleuth, Sidhartha Chatterjee playing Topshe, his cousin and sidekick, Santosh Dutta playing the funnyman Lalmohun Babu and a kid Kushal Chakraborty getting into the skin of Mukul. 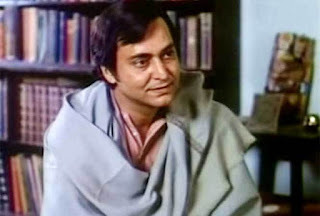 Mukul suffers from past-life regression and yearns to visit his home in a fort, where he says he lived with his family. His otherwise chirpy persona undergoes a sea change, much to the concern of his family as he wakes up in the middle of cold winter nights and paints pictures of forts, camels and war scenes. He keeps saying that he lived in a golden fort and his father used to cut gemstones. This little diversion of usual human behaviour is reported by a local daily and falls under the scanner of two wicked men who think that Mukul's past home has treasure hidden under the debris. So, Feluda, whose mind is a maze and who is an ocean of knowledge (as remarked by his elder brother, and Topshe's father), hears Mukul's father out and decides that he would bring Mukul back safely, in case danger ensues. Feluda and Topshe leave for Jodhpur in an exciting train journey in which they meet the comical Lalmohum Babu, a writer of detective novels. Meanwhile, Mukul meets the two fiends and goes with them after they get rid off the kind parapsychologist, Dr Hemanga Hajra, who had promised to take Mukul to his golden fort. He knows that once Mukul sees the structure, his mental haze will disappear and he will resume normal life. But they do not know the power of Feluda and his bullish mind. With the power of reasoning, his keen perception and eyes and telepathy he just makes it so difficult for the odious plan to be successful. Through desserts and roads, accompanied by peacocks and atop camels, Feluda and his merry men just make this film so, so fantastic. Oh! by the way, in case you were wondering... Sonar Kella isn't a children's film. It is a film that you will love if you want to travel back in time when cinema used to be simple, adventurous and super fun. It's a joy to watch this film, to see how Feluda unravels every mystery, decodes every puzzle. What can be said about Satyajit Ray that hasn't been said before. He just makes things looks so effortlessly impeccable in this film. The music is rustic Rajasthani, to enhance the folk feel of the film, he makes train journeys look decadent and romantic, he lends a goofiness to his criminals so that while you hate them you also feel bad for them for being so vain and stupid. He makes Topshe so earnest and willing to learn and he finds the perfect comic timing in Lalmohun Babu. He paints the film in a stunning sepia that makes me nostalgic every time I watch this film. The sound design and the background score highlights the drama and tension in the plot on one hand and the delightful adventures that unfurl with time. For instance, there is a spine-chilling laughter from Mandar Bose when he pushes Dr Hajra down from Nahargarh Fort. That laughter is still ringing in my ear. Then there is the unnerving quiet preempting the scorpion scene in the film. It's fantastic. The clever dialogues, the secretive glances, everything is in tandem with the script. 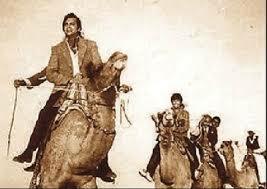 The background score is immaculately matched with the tenure and topography of the film. For instance, in the camel ride scene, the director, who was also behind the music for the film, throws his signature tune (something that you'll find in Gopi Gayen Bagha Bayen) that is laden with the notes of thrill and exploration. It just makes things so riveting. I'm not too sure whether any Feluda flick can come close to this one. I've watched all of them and no, I don't feel the same way about the others. Maybe, it's part nostalgia, part awe. Sonar Kella will always be special.